Dressed to the Eights: Meet the new black-and-gold renditions of the Octo L'Originale Solotempo and Chronograph. 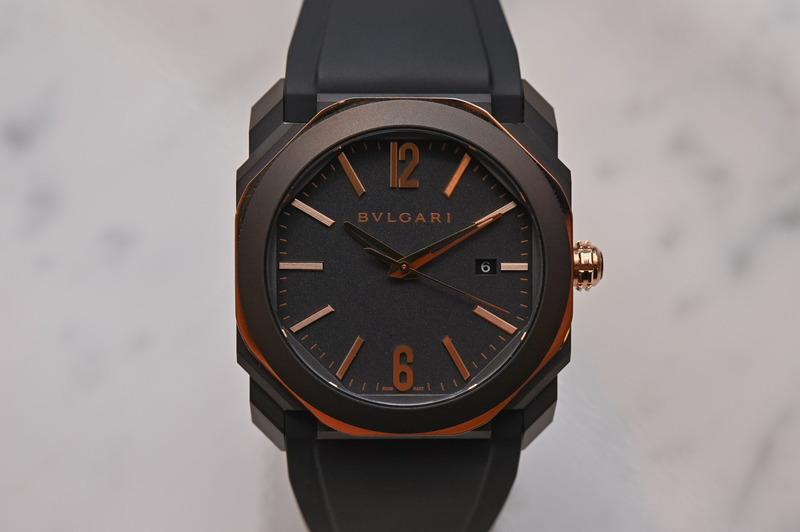 Bvlgari consolidates its winning legion of Octo L’Originale watches with the release of two new variations. 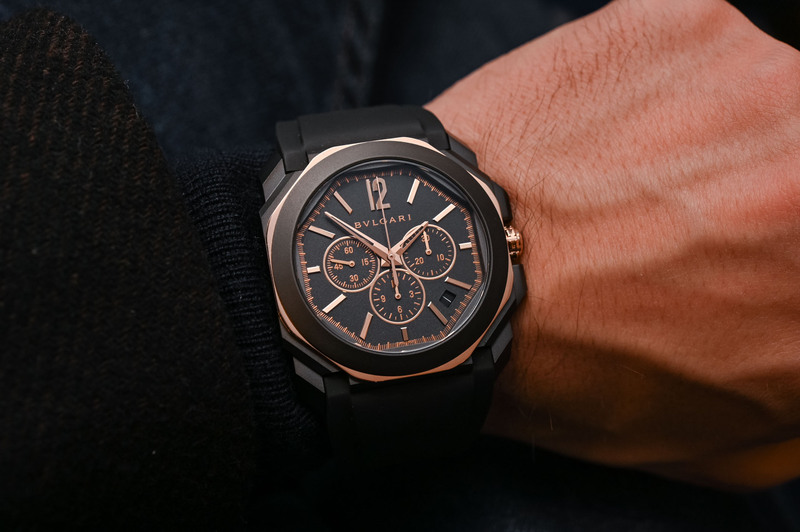 With the same architectural design as their Finissimo brothers, who have secured victory after victory in the battle for ultra-thin, the Octo l’Originale watches come with slightly thicker cases, sportier attire and leaner prices. 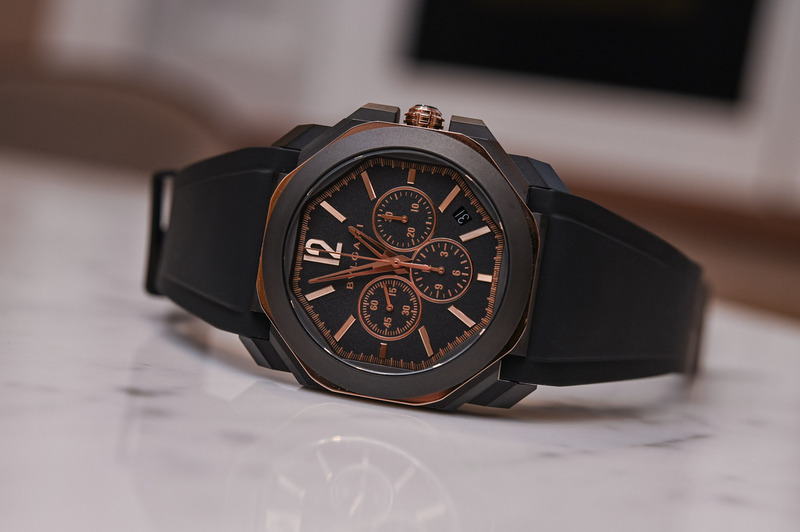 Sheathed in flattering black DLC-coated steel and highlighted with luxurious rose gold details, the sculptural shapes of the Octo case become even more pronounced on these new Octo l’Originale Solotempo and Chronograph watches. The genius of the Octo lies in its highly sculptural, dynamic case design. What is considered by many as the very epitome of a contemporary case design – which marries a round bezel to a pronounced octagonal base – was in fact inspired by architectural features of Ancient Rome. This intrepid juxtaposition of shapes has its origins in Rome’s imperial architecture, to be precise, in the coffering of the Basilica Maxentius in the Roman Forum. Both watches are housed in a 41mm case, though the height of the chronograph is, as you would expect, slightly higher than the Solotempo. The tension between the opposing geometric shapes is maximised with the contrasting use of sandblasted steel coated with black DLC and bright 18k rose gold sandwiched in between the elements and punctuated with a gold crown. 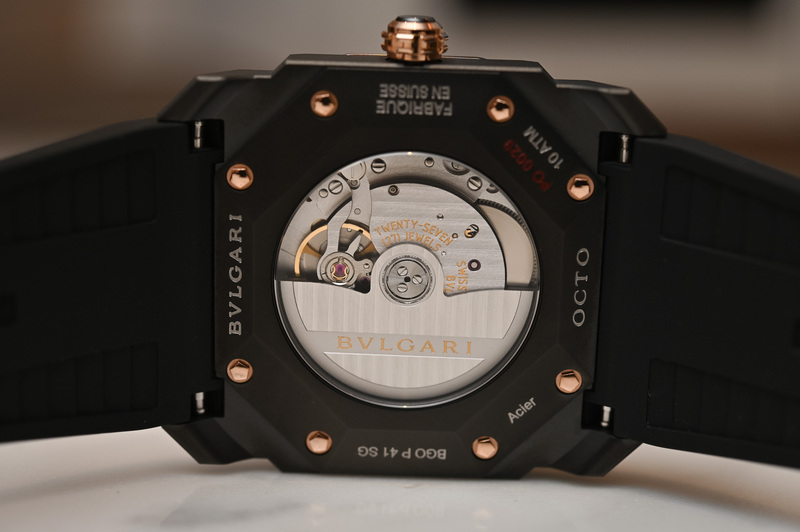 The anatomy of both is cases is identical with a round black DLC steel bezel resting upon a slightly protruding rose gold octagonal platform, which in turn rests on the lower tiered black elements of the case. There are no fewer than 110 facets on the case alone and when viewed from the side you can really appreciate the abruptly stepped walls at the base culminating in a smooth round bezel on top. 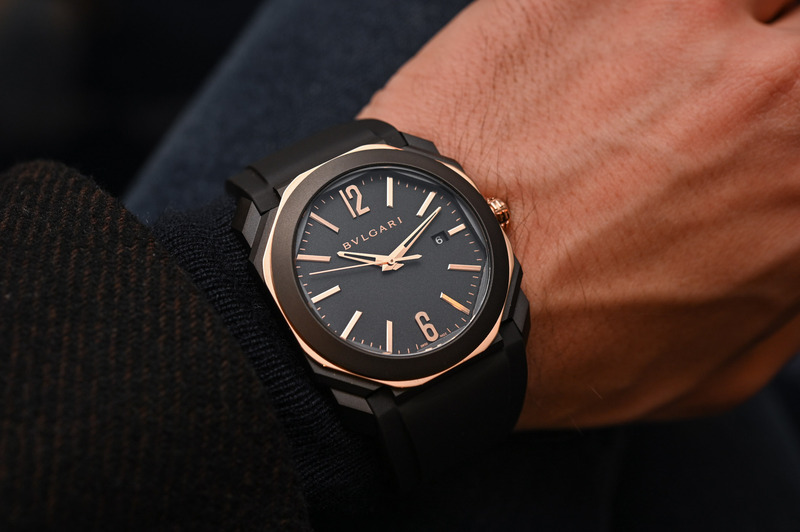 Basically the same watch we saw last year in an understated and lightweight full titanium suit, the new Solotempo model is sheathed in a sandblasted steel case treated with black DLC – a nanocomposite coating renowned for its diamond-like hardness, corrosion-resistance and matte finish – with contrasting 18k rose gold details on the dial and case. The case size of this stylish three-hander with date remains unaltered and measures 41mm in diameter with a height of 10.6mm and water-resistance of 100m. The combination of sandblasted metal and DLC creates a very attractive, slightly gritty surface that is entirely in keeping with the contemporary nature of the Octo. Another aspect you will notice upon handling this model is the additional weight conferred on the case by the combination of steel and gold. Although I love the sober, distinguished looks of the titanium Solotempo, its lightness was an issue for me. I really need to feel the weight of my watch. The colour scheme is artfully continued on the dial with its anthracite background and hand-applied rose gold indices and numerals at 12 and 6 o’clock. The date window at 3 o’clock feels slightly less obtrusive than on the titanium model. If you look closely at the perimeter of the dial, you will notice yet another octagonal motif framing the dial, which in this case, and thankfully, has not been exalted in rose gold. 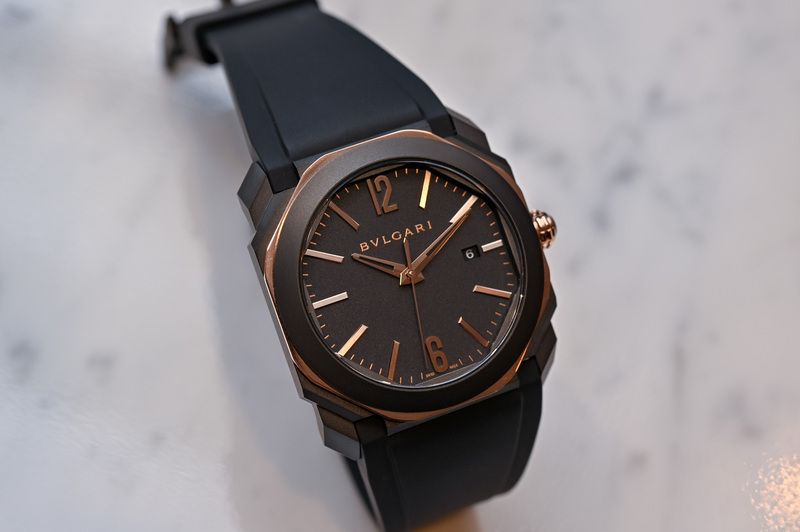 Underneath the sapphire crystal caseback is Bulgari’s Calibre BVL 191 Solotempo, a self-winding, manufacture movement. 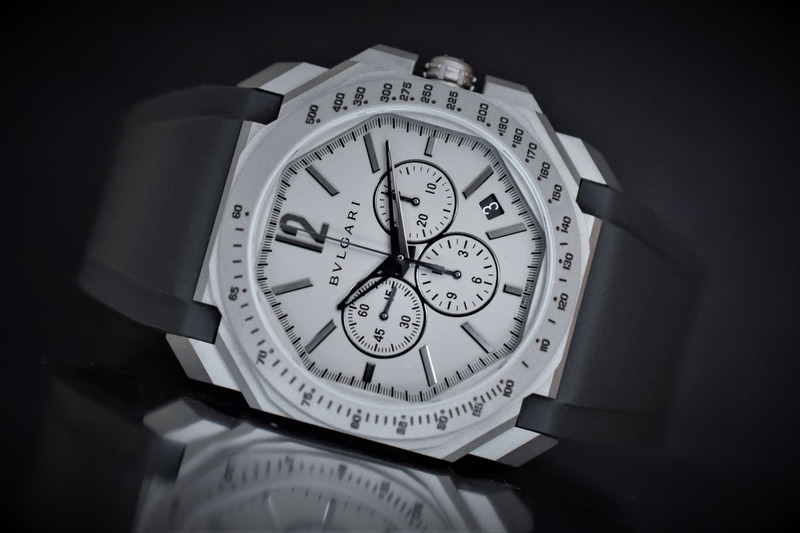 A quality construction, it beats at 28,800 v/ph and offers a 42-hour power reserve. 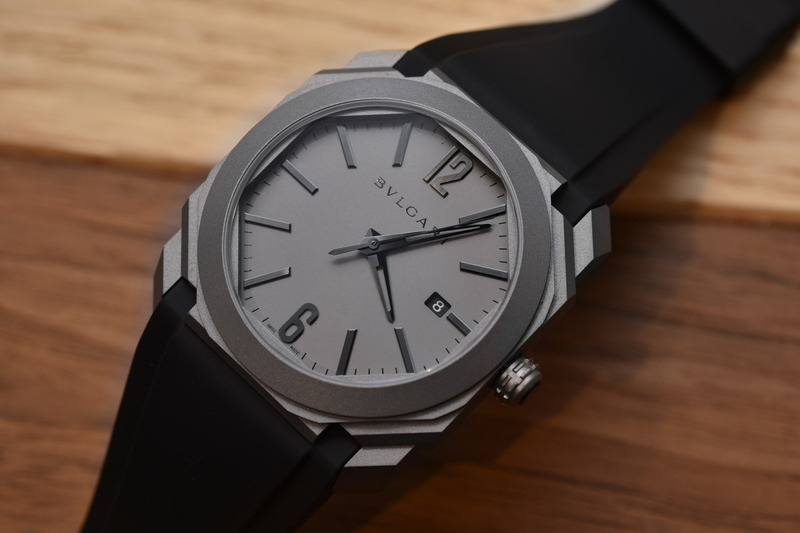 The movement is properly – if industrially – finished with chamfered edges and Geneva stripes. The octagonal bezel framing the caseback crystal also features eight golden pentagonal screws with polished heads. To continue the sleek dark look of the dial and case, the integrated and tapered rubber strap has also been treated in black. 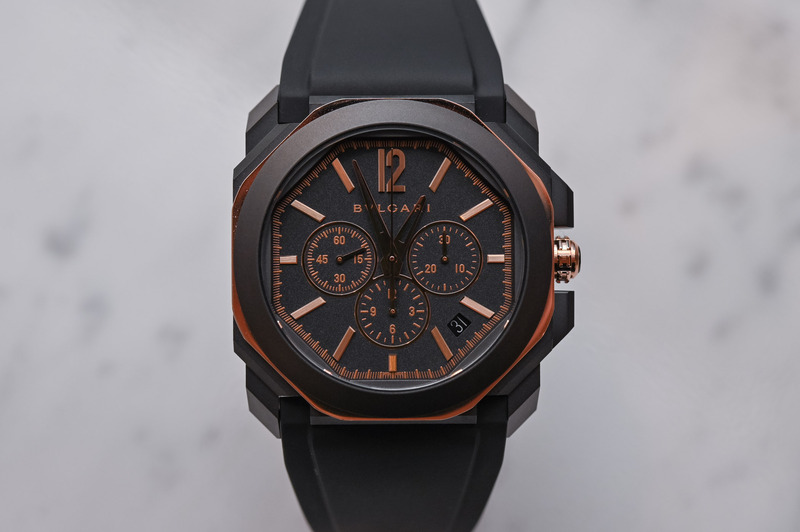 On the wrist, as you can see in the picture, the watch exudes a sensual dark virility with a touch of decadent rose gold. Price for the Solotempo is CHF 7,900 or EUR 8,400. 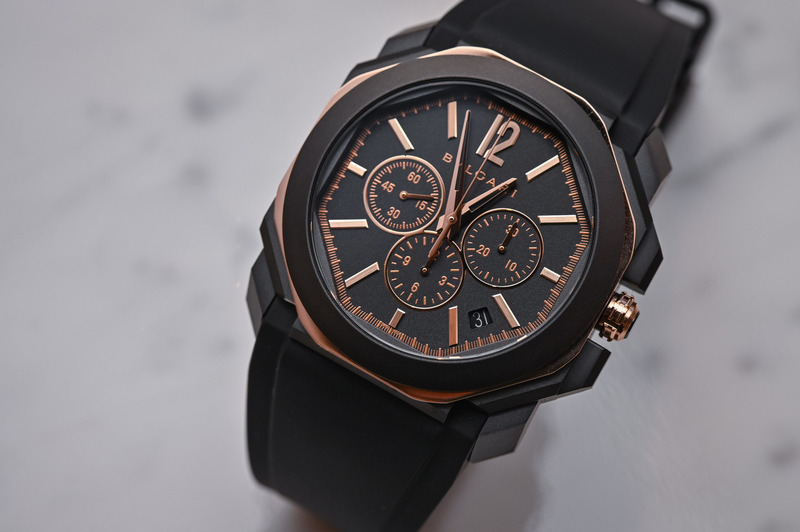 Just like the Solotempo model above, the Octo l’Originale Velocissmo Chronograph has had a makeover and appears in a 41m sandblasted steel case with black DLC and an 18k rose gold octagon and crown. If the case construction is identical to the Solotempo, the case is slightly thicker coming in at 13.07mm, given the chronograph movement inside. 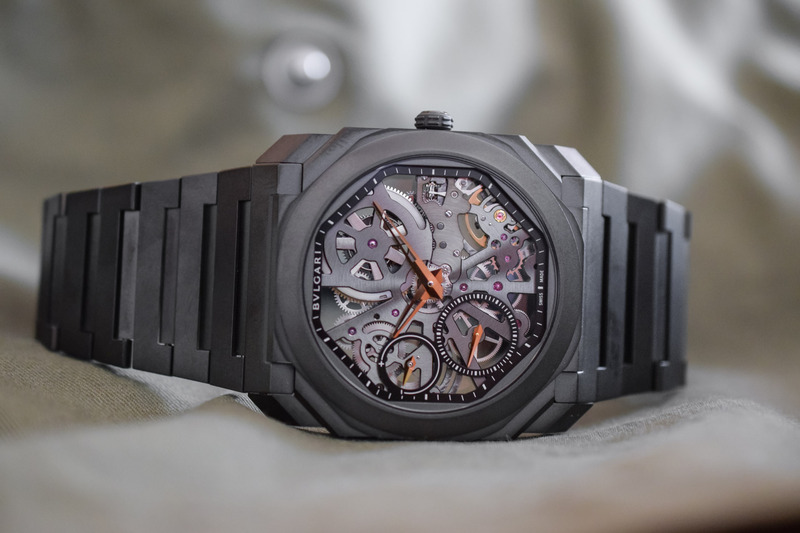 By altering the case materials and shedding the tachymeter scale that was featured on the bezel of the 2018 version of the Octo L’Originale Velocissmo Chronograph, the watch has abandoned the cold, technical look of the titanium model and becomes an object of intriguing beauty. The touches of 18k rose gold and sleek black DLC-coated steel give the watch a luxurious warmth rarely found on your average chronograph. 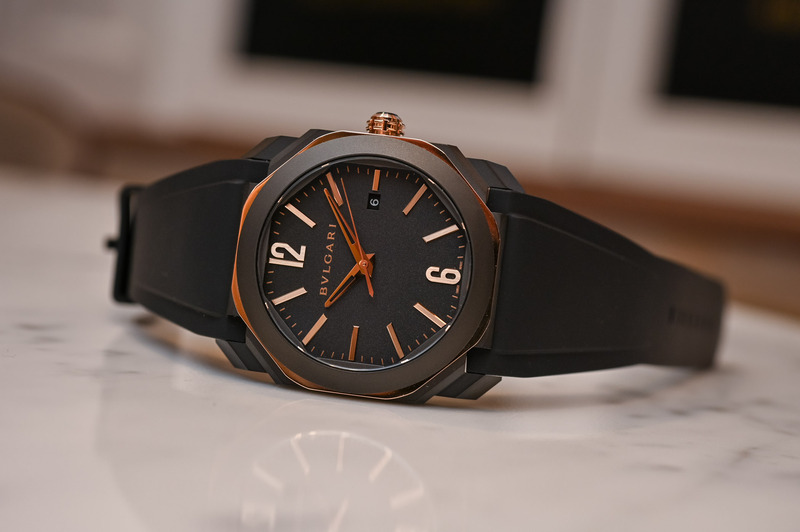 The dial is also crafted in a matte anthracite colour and features hand-applied rose gold indices and a classic tri-compax layout for the registers. 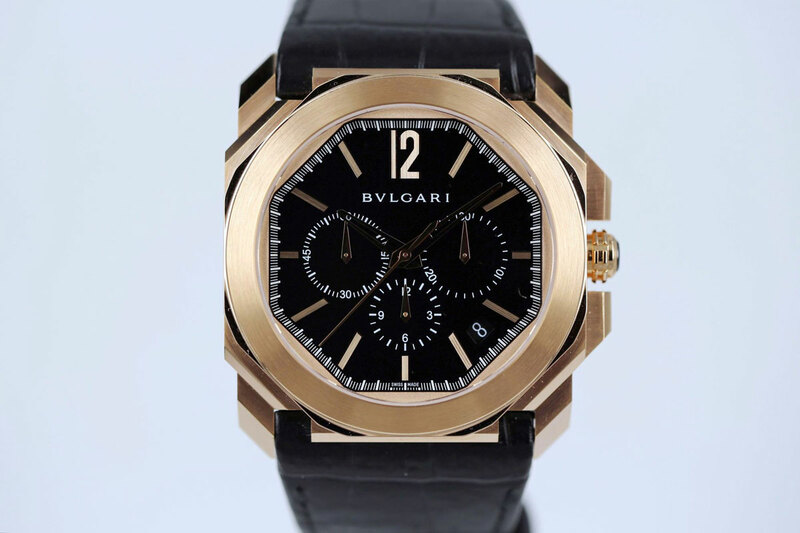 This stylish chronograph is powered by Bulgari’s self-winding calibre BLV328 Velocissimo, which is none other than Zenith’s legendary El Primero – a high-grade integrated construction with a column-wheel and horizontal clutch, which is used by Bvlgari thanks to synergies inside the LVMH Group. 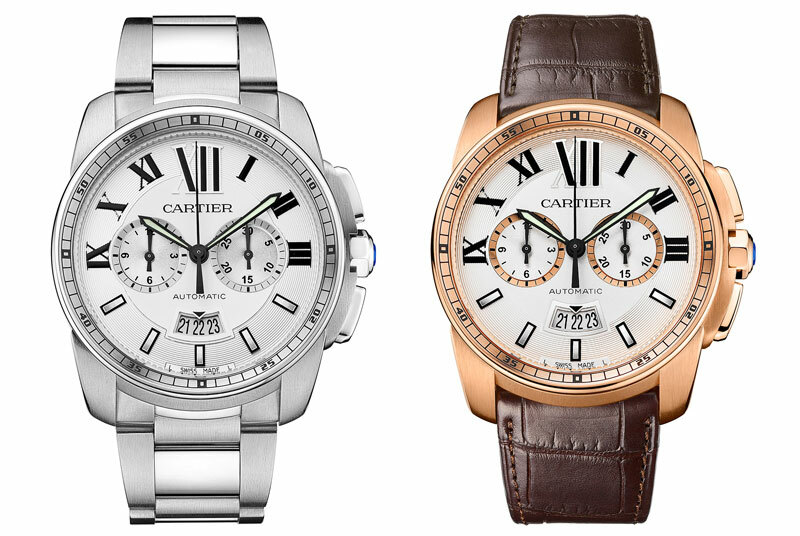 This version of the high-frequency Zenith chronograph is regulated with a silicon escapement. Beating at 36,000vph or 5Hz, it allows for the precision measurement of 1/10 of a second (Velocissimo means “very fast” in Italian). The power reserve is 50 hours. Visible through the exhibition caseback, the movement displays an openwork rotor and elegant finishes including Geneva stripes, perlage and anglage. The Octo l’Originale Chronograph is worn on a large, tapered rubber strap integrated into the case. It is secured with a folding buckle ensuring a comfortable fit. The price for this model is CHF 10,900 or EUR 11,500. The combination of black and gold is almost always synonymous with elegance and luxury. With this dashing combination, these new Octo Solotempo and Chronograph exalt the formidable architecture of their cases. With the hyper-resilient DLC-coated steel case and respectable 100m water-resistance, the Octo Solotempo is definitely a watch that can be worn day in, day out. Although I can’t imagine anybody using the Octo chronograph to jump on board a yacht and time a regatta, it certainly brings a sense of dashing Italian charm to the table. 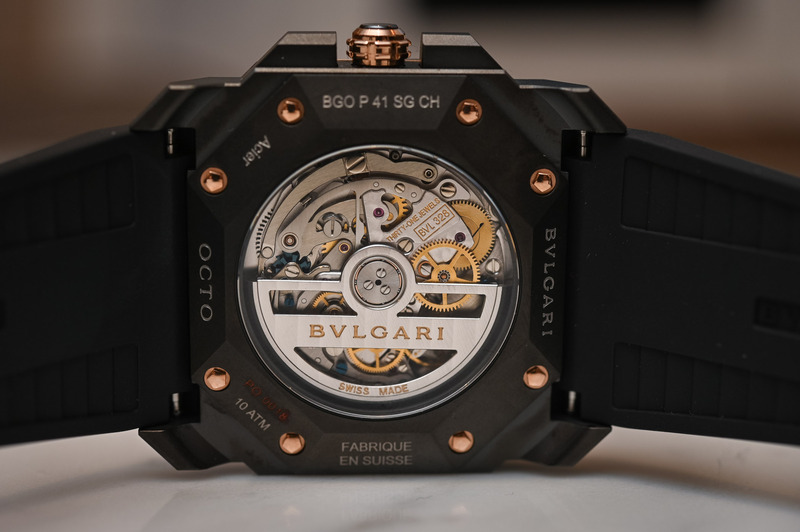 Once again, Bvlgari manages to fuse elements of classic Roman architecture, Italian design flair and superior Swiss mechanics to expand its invincible legion of Octo watches. A link to the website for what? To see these reviewed watches? There not there! Seems to me you have no clue about getting consumers more information! Cards on the table, I don’t like Bvlgari. I find them crass and annoying, and the most annoying thing about them is that they do have a lot of horological expertise, which is ruined by the fact that they seem to court the “Clueless yacht-hopper who cares more about his abs than his girlfriend” demographic. They are a vacuous design house who employ some clever watchmakers. That is all they are. Wearing one of their watches is a sign of a disturbing lack of taste. And can I give Rebecca some advice? Without coming off as a d*ck or getting banned? Can you please actually review the watch? All your reviews read like advertisements! I didn’t notice your name on this article, but the moment I started reading it I thought “Wait a minute. It’s that whatshisname again, isn’t it?” So I clicked on your name and read some more of your reviews. They are all the same! Every watch is a masterpiece. Every curve and line a statement of artistic genius! It makes it kind of pointless to read anything you write. I know that is inherently hurtful to be told, but it’s like having lipstick on your teeth or something. People who don’t give a damn don’t say anything. The best reviewers have strong opinions and personalities and they back them up. They should be fair, and knowledgeable but you should feel like you (and they) know their prejudices. For instance, when I read “X has had a strong brand identity and robust sales network for….’ on another watch site, I know immediately who wrote that article. I PROFOUNDLY disagree with this man about half the time. But I read him because he gives me the information I want and I feel I can trust him to be himself.